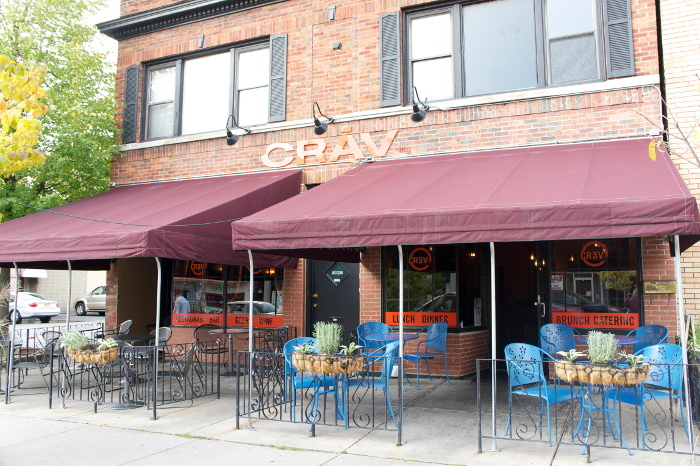 CRaVing opened its on doors Hertel Ave in 2013 to a warm welcome. 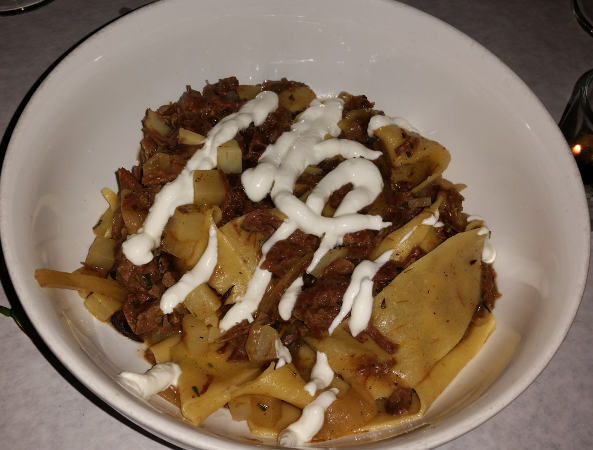 Owners Jennifer and Chef Adam Goetz previously owned highly regarded Sample which was in the snug store front that now houses the new Allen St. Poutine. Where Sample was all small plates, Craving is more the traditional serving size. The space is bigger too, but still cozy. 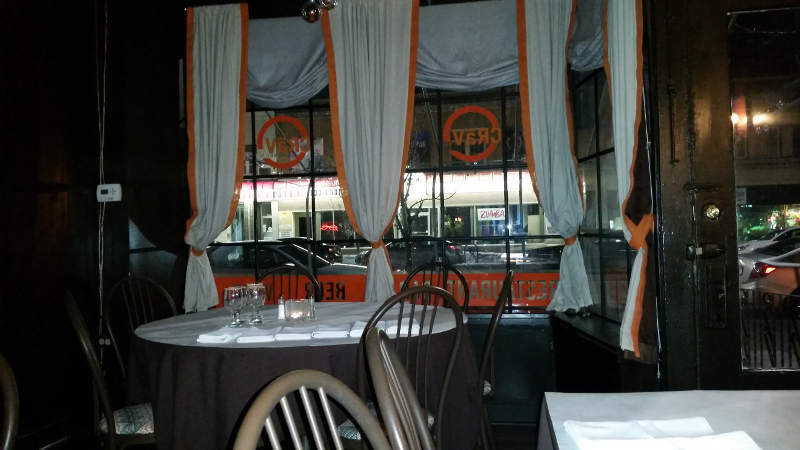 Seating about 40 plus a small bar, CraVing is decorated in browns and iconic orange trim with paper table cloths. They also have a nice patio out front that is now open. It is a casual house where the owners work hard to accommodate their many fans, onsite most days and nights at the front and back of the house. 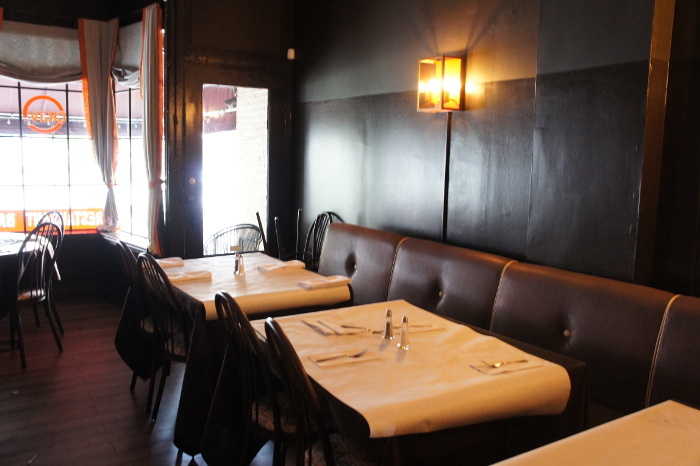 They are open seven days a week for lunch and dinner plus Sunday brunch. Every night they offer a wide range of specials, many nights are special nights (Monday- 1/2 price bottles of wine), and they do take-out and catering. Did I mention they work hard? Chef Adam paid his kitchen dues in various settings from Romanello’s in Hamburg to a swanky country club in Colorado to renowned Waldorf Astoria in Manhattan and back. 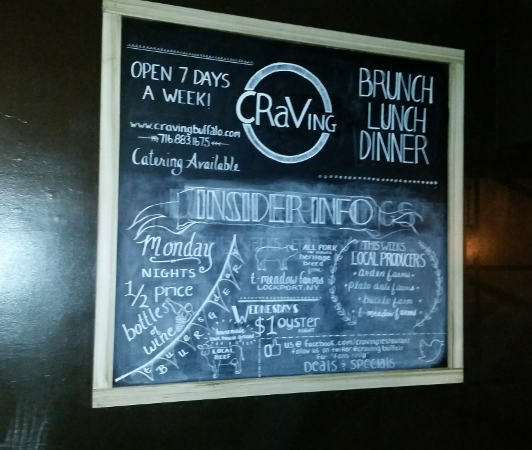 Craving is a casually comfortable, hands-on restaurant and bar that was in front of the curve in the fine-casual dining trend and remains there with locally sourced products cooked to perfection. Chef Adam Goetz has been invited to cook at the James Beard House Sept. 2015, a tremendous honor that is only bestowed on the best of the best. 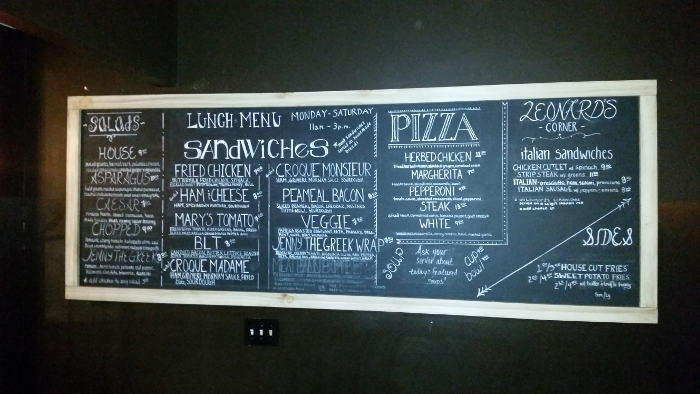 He keeps the menu fresh with a long list of specials daily that are both creative and incredibly satisfying. Probably I’ve had a better dinner out, but I can’t remember when. The menu changes constantly so whether you’ve been or not you should go. 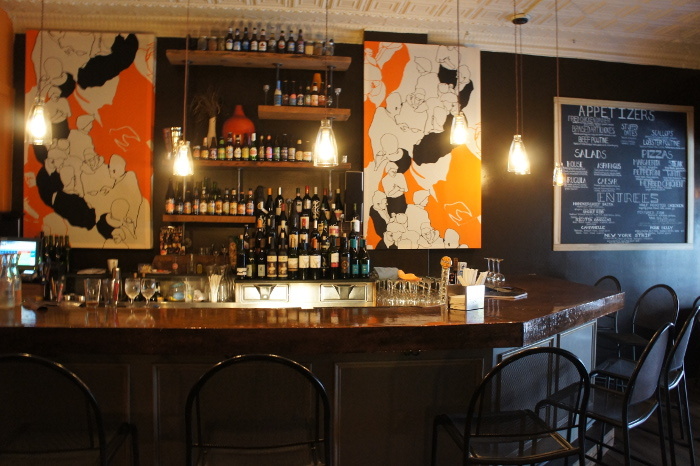 We entered CraVing into a modest bar area and were immediately shown to our table by Hostess/owner Jennifer Geotz. While the standard menu is interesting the nightly specials are the meat of the offerings (my pun) she explained in not so many words. Something new every night. Keep it fresh and regulars are happy to return …regularly. We started out with a couple of glasses of Dark Horse Chardonnay, rich and creamy, and a couple of Hamburg drafts while we looked over the options. Craving has outstanding beer opportunities with 5ish on draft and several more really good options by bottle. Half dozen raw oysters on the half shell from Katama Bay in Martha’s Vineyard – $13. Served with lemon and house made cocktail sauce, they were fresh with a hint of brine, just as mother nature intended. Three large beef bones split down the middle with the gelatin intact. Sure this sounds a bit weird but hits a 10 on the fun meter. 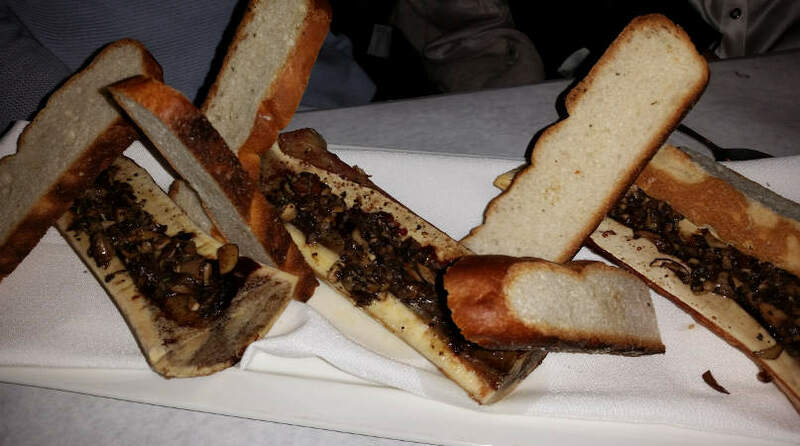 Where the bone marrow gets the headline it’s the #12 mushrooms duxelle (defined as mixture of mushrooms or mushroom stems, onions, shallots and herbs sautéed in butter, and reduced to a paste) that does the heavy lifting. They add a deep substance to this dish that really brings it to life. Spread it on some bread – uummm. 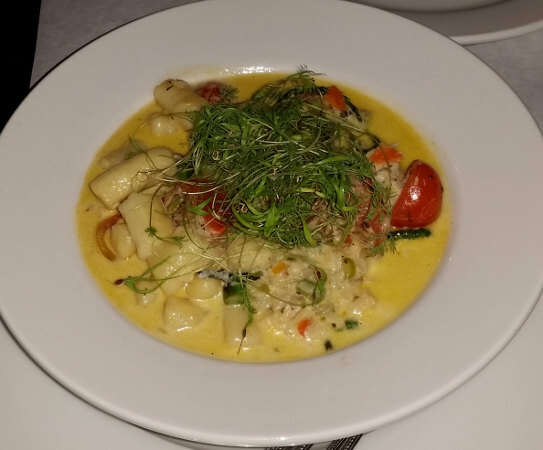 At first glance you’d think the beauty of this soup is the creative take on the traditional New England Clam Chowder. At first bite you realize the beauty lies in the improvement of taste on the creamy soup of the north. Better? In truth this is a different animal, err, seafood, but come on… potato gnocchi (really good btw), asparagus, cherry tomatoes – love that. 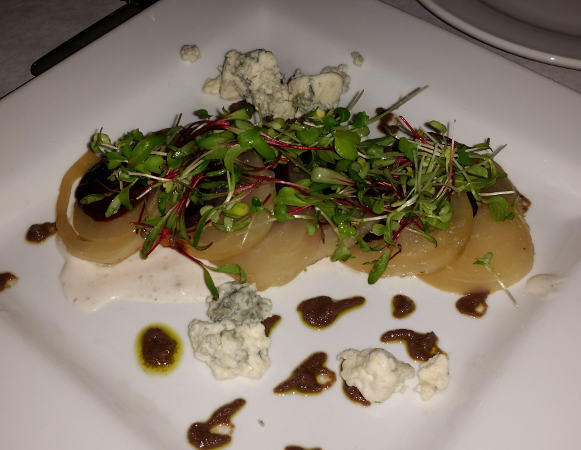 Beet Salad – golden beets, baby beet greens and red cabbage pesto, all locally sourced from Plato Dale Farms out of Arcade, with bleu cheese and topped with a maple walnut crème fraiche – $10. WOW! I know that beets are omnipresent these days but this was stellar- the beets were gorgeous and the flavor combination with the maple walnut is exciting. The bleu cheese is an improvement over the standard goat cheese in my mind. 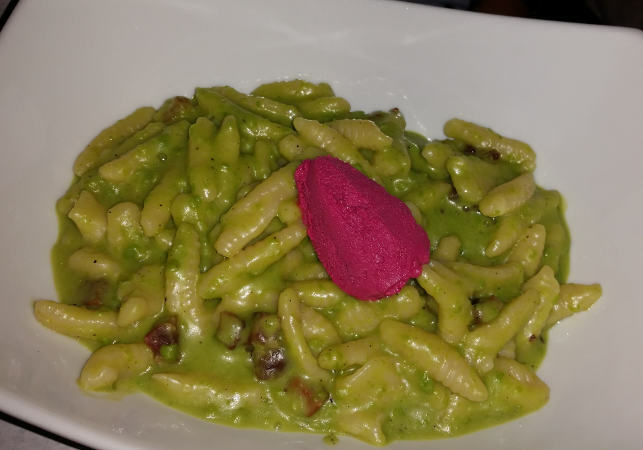 Cavatelli – house made cavatelli pasta, sweet pea pesto, house cured T-meadow farms pancetta, toasted walnuts, CraVing’s Plateau Dalai beet ricotta – $23. The small hot dog bun shaped cavatelli pasta is the perfect vehicle for the creamy sweet pea pesto and the subtle hints of seasoning offered by the nuts and pancetta. The florescence of the beet ricotta brings the whole thing together like a Monet flair. 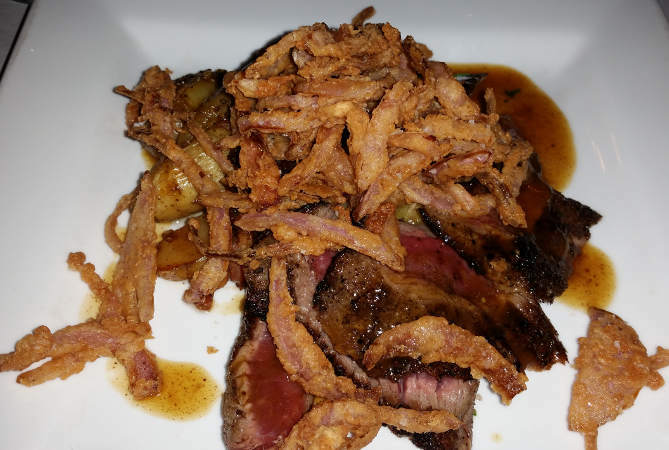 Flank Steak – spice rubbed flank steak, potato and leek hash, fried onions, house pancetta, natural jus – $29. In comparison to our other dishes this is a bit pedestrian but excellent none the less. The steak merely cooked to perfection, usually I prefer my steaks au natural but a flank is the perfect cut to give a little boost. The spice rub adds a nice complexity and the potato leek hash the perfect accompaniment. 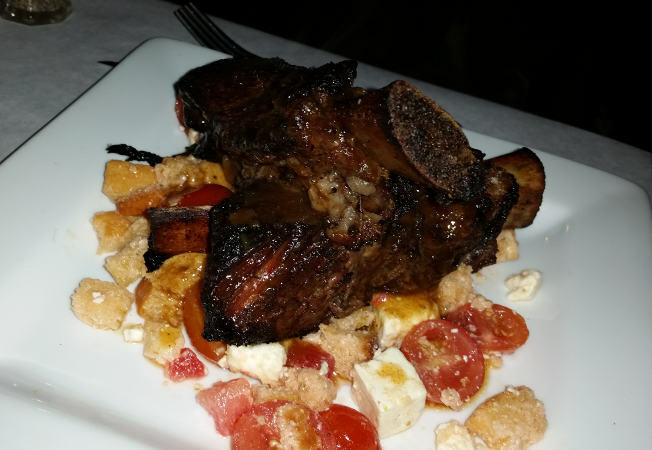 This is a beautifully done short rib, fork tender with a dark crust exterior oozing with goodness. The sugar in the root beer delivers a caramelization that takes this over the top. Egg noodles. The simple title does not do justice to the magnificence of this dish – the best of the night, which is saying a lot in this crowd of over achievers. Is it the fantastic house made noodles or the deep rich heavenly flavor of the short ribs? Certainly a little potato and crème fraiche never hurts. Whatever the secret, this main course is a fantastic combination of flavors that finishes with plenty of regret over an empty plate. 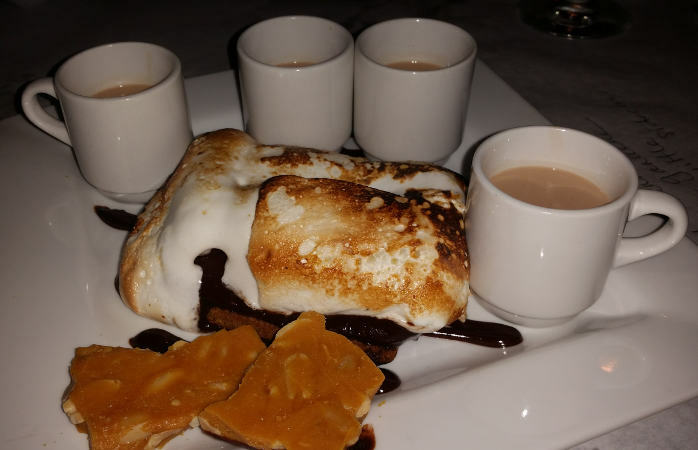 S’More – graham cracker, peanut butter fudge, whipped cream, chocolate ganache, peanut brittle with hot chocolate side cars – $6. Six dollars? Forget about taking the family to the ice cream shop. 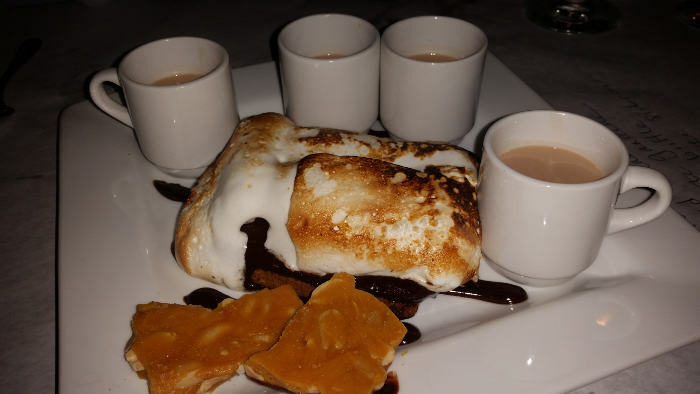 This dessert is enough for 4 people. Eat it piece by piece or in combo. There is so much going on here it’s hard to know which way to turn first. The decadence of dessert never gets to me, but I did feel a little guilty about the ridiculously low price… kinda. I hear the fried chicken (lunch or dinner) and brunch are standouts. Check out their Facebook page to see what’s cookin’.